We hope you take time to follow us in the news including our press releases. TRAY Self-Service-Point-Sales-Annouces-Integration-Sacoa--(BUSINESS WIRE)–TRAY®, the enterprise POS and self-service solution, announced today a new partnership with Sacoa Debit Card System, a leading worldwide supplier of revenue management systems for the amusement, entertainment and leisure industries. This technology partnership will allow TRAY’s cloud-based system to connect with the Sacoa platform, providing merchants with the ability to sell and reload PlayCards from TRAY’s point of sale system and self-service kiosks. This integration not only creates a more seamless guest experience but also consolidates revenue reporting for clients using both systems. SCOTTSDALE, Ariz.–(BUSINESS WIRE) –TRAY®, the enterprise POS and self-service solution, today announces a partnership with MarketMan,–SCOTTSDALE, Ariz.–(BUSINESS WIRE)–TRAY®, the enterprise POS and self-service solution, today announces a partnership with MarketMan, cloud-based inventory management. The integration combines item-level data from TRAY’s point of sale solution with inventory and ordering details, allowing users to streamline back of the house operations. TRAY Self-Service Point of Sale Announces New Partnership with FetchRev’s Automated Marketing Solution–SCOTTSDALE, Ariz.–(BUSINESS WIRE)–TRAY®, the enterprise POS and self-service solution, announced today a new integration with FetchRev, an automated foot traffic generator for local business. Through this partnership, businesses using TRAY’s self-service platform can now monetize the data captured at the kiosk by sending actionable promotional offers. 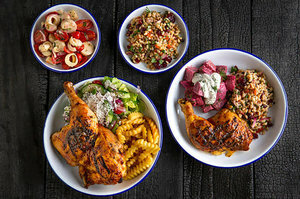 Fire-grill chicken eatery using easy to order kiosk system—(New York Post)–Executive chef Joe LoNigro, founding chef-partner at Otto’s Tacos, brines antibiotic free range chicken for 24 hours, bastes it with a house-made blackened chili honey garlic sauce and fire-grills it. Diners will order via a tray kiosk food image system that is “simple and intuitive,” says Mezzalingua.